Ambrose Wood and Son is a family run business, established over 100 years ago, spanning four generations. 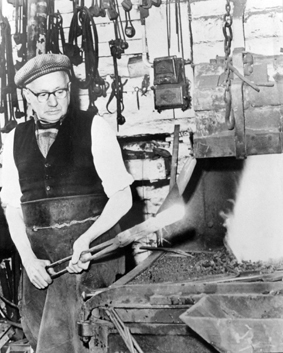 Ambrose Wood was born in 1883 in Biddulph, Cheshire where he began his career as an apprentice to a blacksmith. At the age of 25 he joined Lord Sangers Circus as their travelling blacksmith. In 1910 he had saved enough money to buy premises in Queen Street, Bollington where he worked in partnership with his cousin William Wood. Eventually William left the business while Ambrose continued to work as a Blacksmith and Wheelwright. In 1937 he was joined by his youngest son Stanley Wood who eventually took the business over. Ambrose passed away at the age of 93, by which time Stanley had been joined by his son John who now runs the business with his son Edward.